Just when you think that you've seen it all, a new company pops up on your radar and your scrappy life changes completely. Until about a month ago, I had never heard of the name Harmonie, but most Canadians probably have as their products are sold at many local scrapbook stores to the North (of me). This Montreal-based company produced their first collection in June 2008, debuted at CHA this summer and are just now entering the US market. 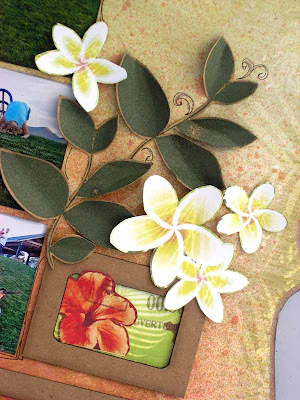 Harmonie carries almost everything from pattern paper to embossing powder to inks to stamps to intricate laser-cut wood, acrylic and chipboard products. Perusing their online catalog, I was immediately impressed by their range and innovation. Each collection (Harmonie currently produces five) contains six double-sided medium-weight pattern paper, coordinating cardstock, 5 ribbons, buttons, pigment ink, stickers, acrylic stamps, embellishment (flowers, leaves or bows), die-cut shape in either acrylic, wood or chipboard, mosaic tiles, brads and acrylic album. Like I already said, they really have everything a scrapper could ever want! 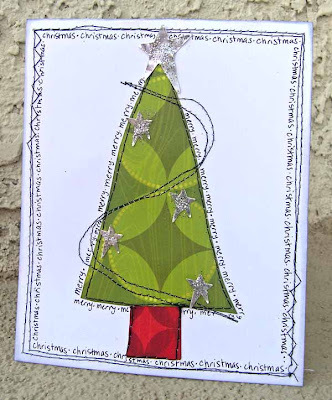 For my review, I was given an entire chipboard calendar kit including pattern papers, coordinating embellishments and stamps. I must admit, my first reaction to the calendar itself was awe. It measures just over 18 inches high, 12 inches wide and 1/4 inch thick. It consists of two pieces of finely laser-cut sturdy chipboard: a front board with multiple window areas and a solid back board with built-in hanger. Also included are 12 white sheets of paper and 4 silver brads to hold everything together. The 12 sheets of paper are printed with an outline of the front "windowed" piece so stamping in the correct spaces and designing is a breeze. Not only that, but once I had finished decorating my calendar, assemblage was a piece of cake. Everything fit together perfectly. That's right! No need to make any bizarro alterations so that the holes in the paper and the chipboard matched up correctly. Coordinating with the calendar kit are acrylic stamp sets containing two sets of numbers: one large and one small, all of the months, and all of the days of the week (in two formats) along with a stamp that says This month. There is really a lot of creative freedom with these sets. The stamps were of high quality and made a very nice impression. Like all acrylic, they lost their stickiness quickly, but regained it after a little clean-up. Overall, I was pleased with them. 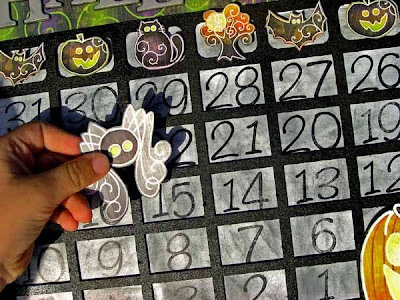 With the input of various small people living in my home, I decided on a Halloween Countdown Calendar. In our lives, Halloween is almost as important as Christmas and sometimes a mother needs to know exactly how many days are left before the glorious night of Trick-or-Treating. This calendar will aid us in that quest. Thank heavens. Each day the cute spider moves a little closer to the smiling Jack 'o Lanterns and we are a little closer to CANDY! Thank you to Elyssa, my hand model. 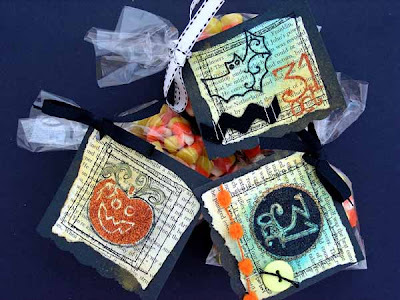 Continuing along the Halloween theme, I made up a few treat bags for teachers and an extra tag using Harmonie's double-sided stickers. These things are really cool. 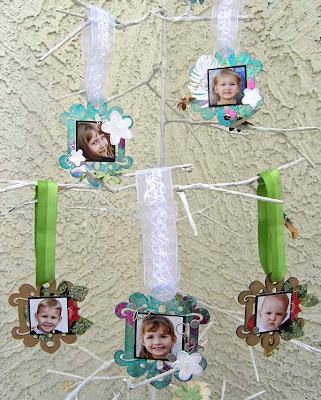 They are sticky on both sides so you can customize them to your project by applying glitter, flocking, foil or perfect pearls to the top. Because they are extremely intricate, the stickers a bit tricky to use at first. However, my bumbling mistakes are to your benefit. This is the technique that I discovered worked the best. 1. Cut the desired sticker out of the storage sheet before you try to peel off the protective coating. 2. 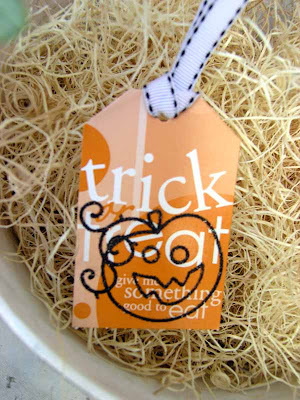 Peel off the coating and remove the sticker using the straight edge of your scissors or your poking tool. Do not try to do this with your fingers. It is quite difficult. 3. Adhere the sticker to your project. 4. Apply glitter or foil to the sticker. If you apply glitter before you adhere the sticker to your project, glitter will get on the wrong side and it will be tough to stick it down. If this happens to you, a dab of Mod Podge will save your sticker from utter destruction. Now on to the pattern papers...I liked their quality and feel. Their colors are vivid and the designs fun and interesting. Plus, each collection contains one shaped paper. The weight of these papers would not hold up solo as background paper for my chunky layouts complete with paint, metal and misting, but they would certainly be strong enough for the basic photo, pattern paper, small embellishment-type layout. Those leaves are a stamp! My last project are 5 ornaments for this year's tree using the ribbon packaging as a base. 1. The intricacy of the stickers and the products is simply amazing. This company focuses on the details. 2. The extra pieces of chipboard from the calendar are all included. This gives you lots of extra stuff to use on other projects. (Like I did on my layout.) No waste! Love this! 3. The way their collections are organized is amazing. Everything coordinates. Buttons, stickers, stamps, you name it, Harmonie carries it. It's a one-stop-shop. 1. This is less of a dislike and more of a warning. Because of the nature of laser-cutting, the areas of the calendar that were in direct contact with the laser are sooty. Your fingers will get dirty. A damp cloth wipe down is a necessity. 2. I didn't like the fact that there were only 12 sheets of paper that came with the calendar kit. I would have liked to have1 extra, just in case of a major mess-up. 3. The double-sided clear stickers are a bit tricky to use. There is definitely a learning curve when it comes to using them. What do YOU think? Have you heard of Harmonie before? Tell me what your thoughts are on their products. I'd love to hear your opinions! Leave me a comment by Tuesday at noon EST and you will be eligible to win a kit of Harmonie products including the stamps that coordinate with the calendar kit! I have never heard of Harmony before. I had a quick look at their catalog and I love their stuff! Simply fab! Boy they need to find someone to sell their stuff online-it looks fabulous! I think I'm really loving this company. I like that their items come in chipboard, wood and acrylic and those albums?....I LOVE them. Those little birds are beyond cute as well. I think some of the papers are a bit formal for my pages but others are just right. I'm really loving their stamps that one tree that is sort of tall and skinny is a must have for sure. Okay I didn't see them the first time but this company makes personalized monogram stamps. They are beyond perfect for weddings or gift giving. This company seems to have it all. I love the diversity of styles they have as well. I'll be watching them for sure. I'm definitely checking Harmonie out! The layout was amazing, the calender was gorgeous, what else can one say? Love those colors and patterns--elegant and classy! They are just gorgeous...hope they come to my area! I've never heard of this company before - they have lots of fun things to scrap with! I'd love to get my hands on some of the products. 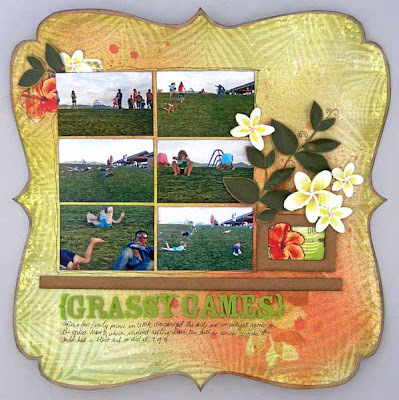 I've never come across this company before, but I LOVE that calendar and would so love to make one for my granddaughter. I am going to check them out. I have never heard of them before but would love to try some of their products. I've never heard of them before but there stuff looks awesome! The store I work for, The Urban Scrapbook in Edmonton, has ordered almost everything! We have at the moment, the Halloween, Christmas, and Pacifique papers, which are even more beautiful in real! My favorite items,which I am waiting for, are the acrylic albums and mosaic tiles! I never heard of Harmonie before reading your review. Everything looks great. I especially like the acrylic stamps...just perfect! Great review! Thanks for the introduction! Wow, I haven't heard of them but their products sound really cool! 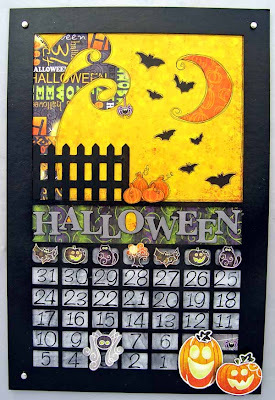 I love the Halloween calendar you made! Personally, I tend to steer away from pattern papers that are less than cardstock because I love distressing and having the versatility that cardstock offers, but I do like their patterns, and those double-sided stickers sound like just my kind of thing, I'm always die cutting thermoweb peel n stick sheets and doing things to them. Thanks for the review and the chance to win! I never heard about them but I really liked what I saw. I will be looking for their products. Great review! LOVE your calendar and love love love that Christmas card! I can't imagine Imaginisce isn't a little miffed by their logo though... it was the first thing I thought of when I saw it!